The return of True Believers means the return of a great selection of things to do at the event, including a Panel, workshops, Superhero Life Dawing and (for the first time at Troobs) some Learn To Draw classes too. All of these activities are aimed at all ages and abilities and are free to join in with as part of your ticket price. Please note, space at these activities is limited and will be given on a first come first served basis. Below is all the information you need about what’s going on and when. You can find more info on the panel, workshops and Drawing classes below. Ever wanted to know what it’s like to work on Star Wars or maybe Doctor Who? Wondered what goes on behind the scenes at Marvel, DC, Dark Horse and more? Then now True Believer is your chance! Come along and ask artists Mike Collins and Nick Brokenshire about their experiences on these fantastic properties and maybe get some art tips along the way. These two guys have loads of experience in the comics industry that they’ll be sharing with host Tony Esmond so pop along to the Castle Suite at the event. So you’ve turned your idea into a story, and now your looking at how to turn it into a comic. Panelling and Pacing your comic are two key elements in keeping both the story and the art flowing. Join Cog Life Comics’ Mike West as he talks you through the tips and techniques to think about when pacing out your comic. This year we’re launching the first - of what we hope will be regular - Learn To Draw sessions, in which comic artists give you a quick walk-through of the basics for drawing a particular thing or character. 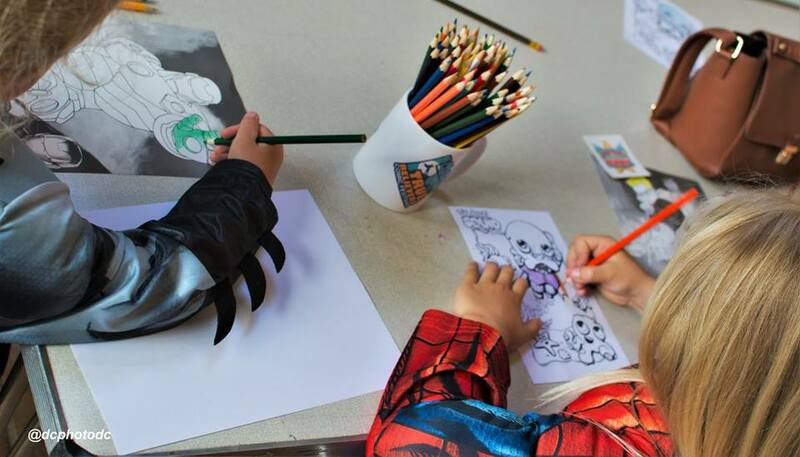 The classes are designed to run for 10-20 minutes and will feature a guest artist giving you a step by step guide in how to draw some of your comic book favourites. The Troobs Creates Superhero Life Drawing Class is back by popular demand. Join artist Andy Hanks (I Am Zoot) and our model LimeGreenJelly Cosplay for another life drawing session, that gives artists of all ages and skills the chance to take part in a fun drawing class with a live model as your muse. This year, LimeGreenJelly will be cosplaying as Bombshell Batwoman. We will also have some drop in activities running throughout the day, including our Draw Something Saturday Jam Piece and some activity sheets to do on the day or take home and do later.